Decorating the master bedroom can be an overwhelming task. There are plenty of ideas that can be taken into account making it more challenging for those who do not have a background in interior design. Among others, a fireplace is one of the best additions, which will not only be good in terms of aesthetics but will also provide the warmth that you need on a cold night. 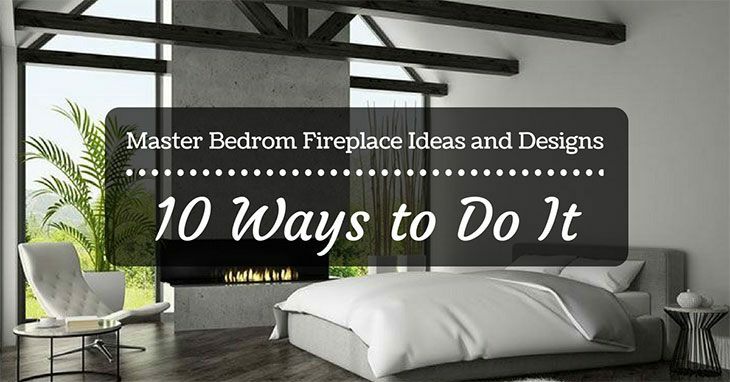 In the rest of this post, we will briefly tackle some of the best master bedroom fireplace ideas & design. Many of which are simple, making it easy to complete for anyone. 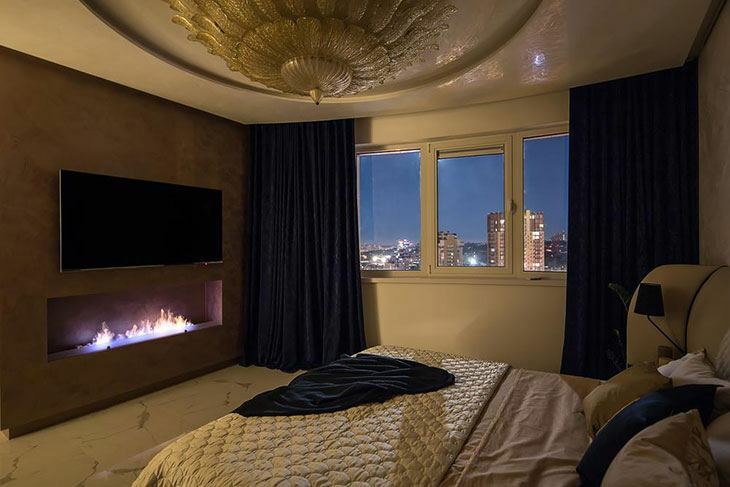 For sure, a fireplace will make an excellent focal piece to have a more beautiful bedroom. The main function of a fireplace is to make you warm during the chilly nights. With this, it will be a good idea to give such focal point a warm look as well. Choose materials with a dark color, which will perfectly complement a master bedroom with light walls. Wood is one of the best materials. Its dark color will add warmth to the room, apart from the fire that it will produce. If you will opt for bricks focus as well on dark and warm color pallet. A lot of people have hesitations in adding a fireplace in the master bedroom because of the thought that it is complicated. Yes, constructing one can indeed involve a lot of work. However, if you want a simpler solution, an electric fireplace will be a good idea. An electric fireplace is great because it starts a fire in an instant, often with the press of a single button. They are available in a wide array of designs, making it perfect if you want to add a modern touch to the bedroom. Thinking of designing a master bedroom that is fit for a king and queen? The addition of a fireplace will be a good idea. Make it big, similar to what you can see in grand palaces. Pay attention to the details and make sure that the sides have ornate design patterns. It will also be good to paint it in gold. To achieve a more royal look, pay attention to the other decors in the room as well. For instance, on the top of the fireplace, you can install a huge mirror. Also, it will be good to have a four-poster bed with elegant drapes. A traditional fireplace will look like a square or rectangular box. This can be boring for some people, especially for those who dare to be more creative. A good alternative would be a fireplace that is set on the floor of the master bedroom. When there is no fire, it will look more of a small bathtub. When there is fire, on the other hand, it would seem more of a fire pit. This is a good idea if you are trying to achieve a rustic look for the master bedroom. Consider this design if you have a room that resembles a charming log cabin. Rather than using other materials, the fireplace should be surrounded with stone. This is excellent because stone is also good for heat, which can improve the efficiency of the fireplace. If Europe is your favorite destination and if you want your room to be reminiscent of the latter, this is an excellent design that you might want to consider. A small fireplace made from marble will surely be a great addition to the master bedroom. To make it more reflective of Europe, you can add other unique touches, such as a picture of Eiffel tower in one corner of the room. It will also be best to stick with white and lush cream colors. 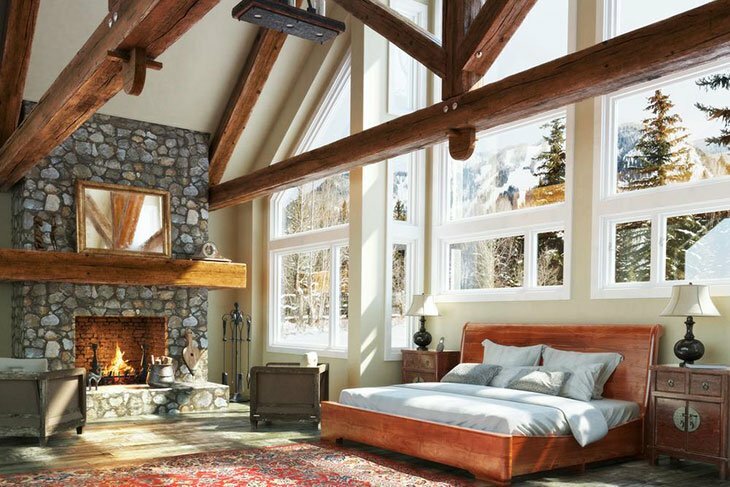 Simply put, a peninsula fireplace is a three-sided fireplace that can also function as a divider in the master bedroom.It can separate the main bed from the dresser or sitting nook. Regardless of where you are in the room, I can be sure that you will stay warm since heat will be distributed evenly. When we speak of fireplaces, we will most probably instantly think of those that are surrounded by brown wood or stone. We seldom think of those that have playful designs. The latter can be perfect for those who opt to be different and add more color to the bedroom.One of the things that you can do is to use green accents for the wall. Red, blue, and orange will also be good, depending on the color that you love. Also, add a metal gate to cover the fireplace and an accent chair to complete the look. Designing a fireplace should not be only about aesthetics. Rather, you should also think about its use in the bedroom. Aside from producing heat, it will also be good if the fireplace can double as a base for television, picture frames, and accent pieces. Whether you opt for a narrow or wide base, see to it that you can utilize the space on the top of the fireplace. It will be better if it is wider, which will allow you to put more. Consider futuristic fireplaces if you want to have a room that is minimalist yet the décor is unique. Experiment with various materials and design. Keep it simple, but do not forget about aesthetics. One of the things that you can do is to place a metal extractor in the corner, which will function as the chimney of the fireplace. In the bottom, on the other hand, add a huge basin, which will serve as a fire pit. It can be made from different materials as well, but make sure that it will conduct heat efficiently. By now, we hope that you have learned from the master bedroom fireplace ideas & design that we have tackled earlier. 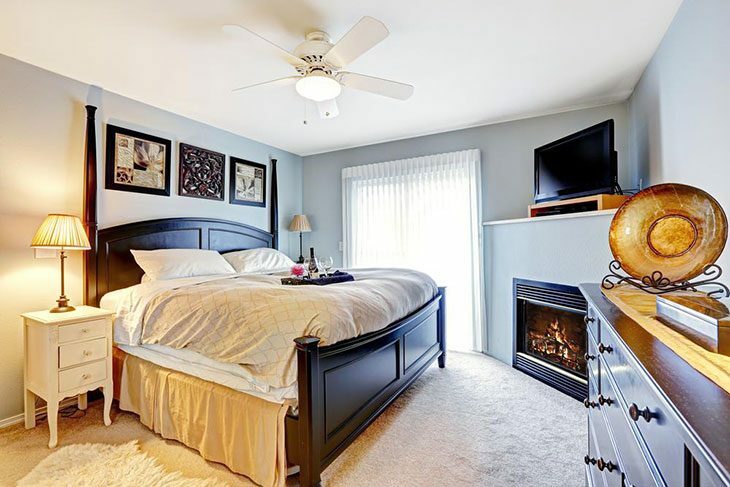 Whether you are on a tight budget or you do not mind splurging, there are many ways to add a beautiful fireplace in the bedroom (Source). Did you enjoy reading this post? Are there other designs and ideas that you would like to add? Feel free to leave a comment below.